← How does an average Chinese migrant worker become a “nationalist” rioter? Whether this was a slip (unlikely) or calculated rhetoric, it is a good illustration of just how little weight Zhong Sheng articles really have as representations of China’s official position and, more broadly, how not everything in the People’s Daily represents the voice of Chinese authority (let alone the PD Online website). [Zhong Sheng articles are] considered quasi-authoritative in the sense that, although indirect and implicit, they are intended to convey the view of an important PRC organization [and] appear to be written by the editorial staff of the People’s Daily International Department. . . . Zhong Sheng articles fall below editorial department articles, editorials, and commentator articles in the People’s Daily hierarchy. In possibly a further illustration of the relative lack of authority vested in Zhong Sheng’s pieces, two of China’s biggest news portals have been allowed to latch onto an innocuous sentence justifying China’s growing power projection, and twist it into their headlines to sound like the People’s Daily had published a Leftist attack on the basic national policies of “reform and opening”. 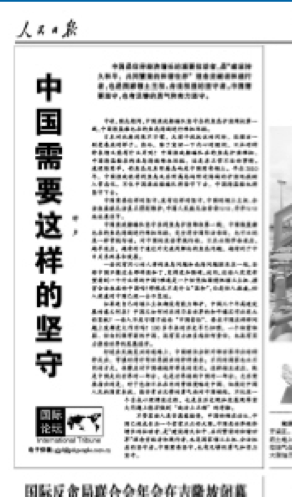 ‘People’s Daily: if the territory cannot even be protected, what significance does China’s rapid development have?‘. Sina followed two minutes later, apparently taking both their cue and content from Phoenix, for the headline there was almost exactly the same. Long live the motherland! Long live the people! Good question! Ask the government! 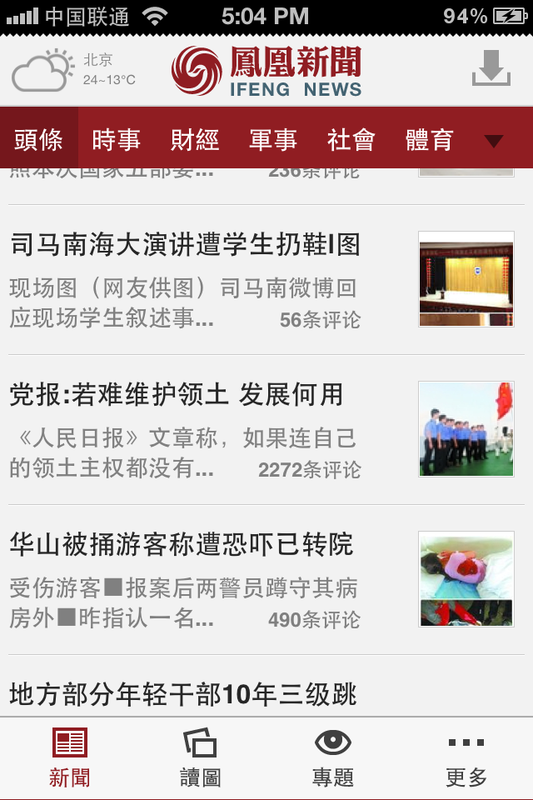 Some headlines start on Weibo, and often via the People’s Daily Online’s account. 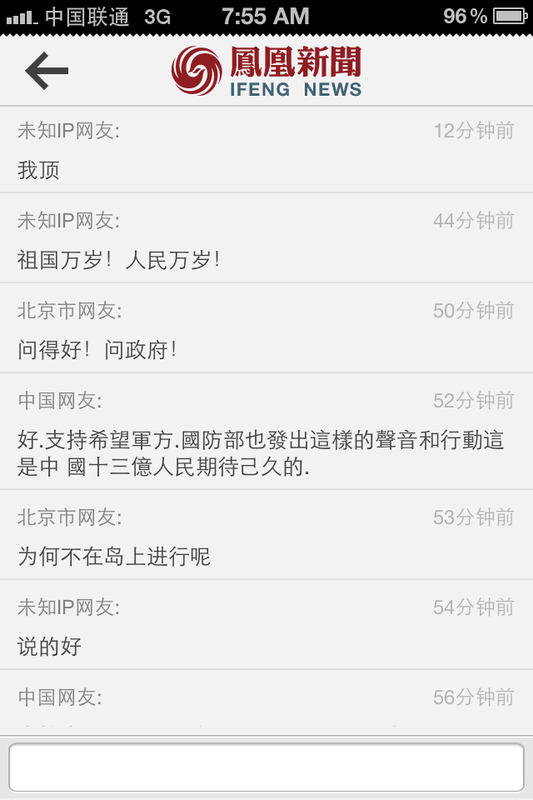 But this one didn’t appear on Sina Weibo or Tencent Weibo until nearly 6am. It appears that Phoenix staff themselves hatched the ‘People’s Daily: if territory can’t be protected, what use is development?’ angle all by themselves, and there has been no attempt at changing it. This looks, then, like another example of a hardline editorialising at Phoenix on a foreign policy issue. That list has been growing since mid-2011, when early posts on here kept encountering the site’s overwhelmingly Maoist comment threads on the South China Sea issue. Since then it has often been the strongest of the five major mainstream portals in emphasising PRC-Philippines conflicts in its headlines. Phoenix allowed only grief and praise for Kim Jong-il, was the only major portal to cover the tiny anti-Philippines protests in Beijing in May, and was happy to leave the “unmasking” of a Philippines anti-China protest organizer as its #1 story even as its competitors deleted their comment threads as online calls for her assassination snowballed. Phoenix was also one of three major portals that, similarly to the treatment of the Zhong Sheng article described above, pumped up an innocuous comment by Admiral Li Shihong to sound like a criticism of the central leadership over Scarborough Shoal. On the other hand, there have also been a couple of counterexamples: Phoenix did not appear to give much emphasis to Long Tao/Dai Xu’s call for war in the South China Sea in September 2011, and unlike some other portals, it did not portray Tang Jiaxuan’s comments about the recent flag-snatching incident involving the Japanese ambassador’s car as anti-patriotic. But if there is such a tendency in the editorial policies (or politics) of this Beijing-based (not Hong Kong, as commonly thought), NYSE-listed company, what would explain that? 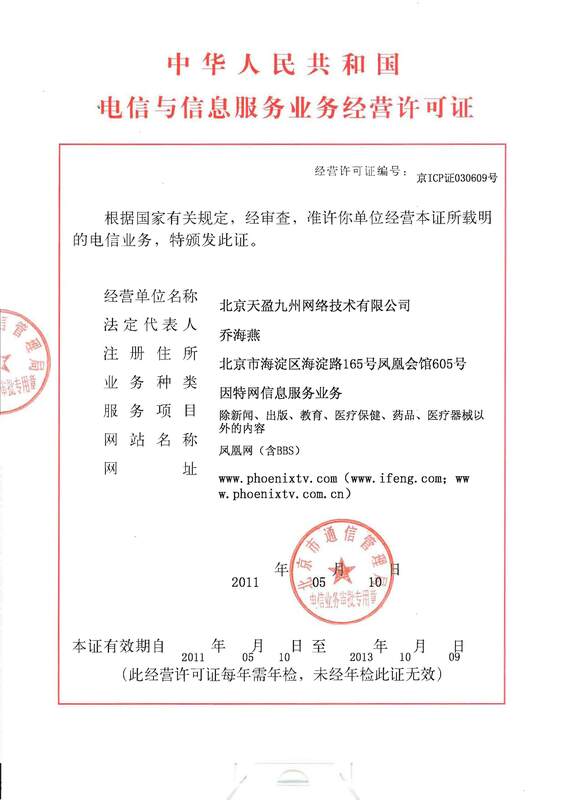 Phoenix has a unique position in the news market, being able to exclusively use content from Phoenix TV (which is also moving to Beijing this month), and although their rivals Tencent, NetEase, Sohu and Sina also now offer a plethora of news video content, it is clearly seen as closely affiliated with, if not the website of, the heretofore Hong Kong-based satellite channel. So are they chasing the Maoist market? Are they trying to prove their trustworthiness to the authorities by positioning themselves as intensely patriotic? Is there a staunchly nationalist editor or manager somewhere who occasionally stamps his authority on the site’s coverage? Have they aligned themselves with particular group or individual within the Party, whose preferences they now endeavor to reflect? Or might they really not be that different from the Huanqiu Shibao/Global Times — seeking profits while acting in accordance with particular roles they need to play in the CCP’s media strategy? I don’t know, but these are among the many things i’m here in Beijing to find out. (†) Wouldn’t it perhaps be a smarter propaganda strategy from Japan to actually not provide so many updates on the PRC’s activities around Diaoyu? Because it is the Japanese Coastguard’s reports that nearly always form the basis of China’s own media reports. Entries into the 12nm “territorial sea” are impossible to ignore due to the customary diplomatic protests that inevitably ensue. But if, instead of once a day, or as it happens, the Coastguard were to report once a week the number of Chinese government vessels that patrolled in the contiguous zone, it would quite seriously hurt the credibility of the PRC media’s reporting.